Really capture your audience's attention with this voyage into the techno tunnel. It's high tech, it's sci fi, it's great for your set! No more boring static backgrounds if you choose this video loop, perhaps it's the footage your video collection was lacking. 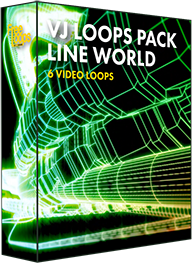 This video loop is part of VJ Loops Pack Line World.